I can’t believe it. So close yet so far. 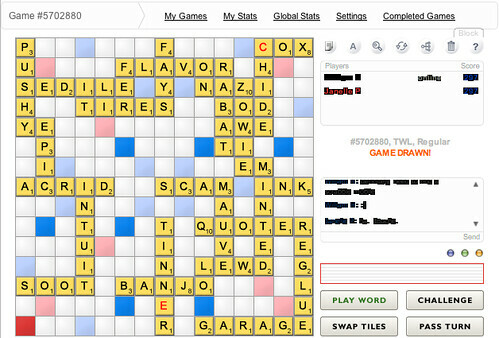 See, I’ve recently gotten into Scrabble and love playing it whenever I can. When I saw that there was a Scrabble Facebook app, called Scrabulous, I did not hesitate to add it and begin playing online immediately. Since then I’ve started many games with people. Most I have won. One person I have had trouble beating is my friend Janelle. She’s a Scrabble beast. Well, in our most recent game I seem to have been able to keep the game close, us both exchanging first place position several times. As the game was drawing quickly towards close I came out with a monster 58-point word to take a significant lead. I held the lead for several turns even as Janelle closed the gap. It came down to the last turn. She came forth with a nice 35-pointer to take a small lead. I had three one-point letters left… 2 O’s and an S. Finding the one place to give me the most points for my word, I played my last 3 letters, thereby going “out” and getting a few bonus points from whatever was left in Janelle‘s hand – hoping they would be enough to bring me back on top. It may be hard to see the letters (as Leopard seems to have an issue with certain pieces of text in Flash, only in Scrabulous), but we tied. After all that…. going back and forth with the lead. After several great big-point words. And after staying up ’til almost 3am…. tied. 297 to 297.
hmmmm, it seems i may have to join yous for a game or two. I usually play the yahoo version “Literati”, same principle, im sure i could provide a decent challenge.